Patton SmartNode gateways running SmartWare can easily be configured and provisioned from within the 3CX Phone System. Just select the model from the drop-down and fill in the necessary parameters, load it in the SmartNode and you are ready to start making and receiving calls. This is great, but what if you have a new Patton SmartNode running Trinity? How do you configure it like any other SmartWare SmartNode device in 3CX? Don't waste any more time thinking about it as Patton just made it easy for you to accomplish this. Patton has created new templates that are available to download and install into your 3CX Phone System. Just a few simple steps and you will be configuring your Trinity SmartNode devices in no time at all. Trinity FXS SmartNodes (1-8 ports). Download the NewTemplate.zip file attached to this article. 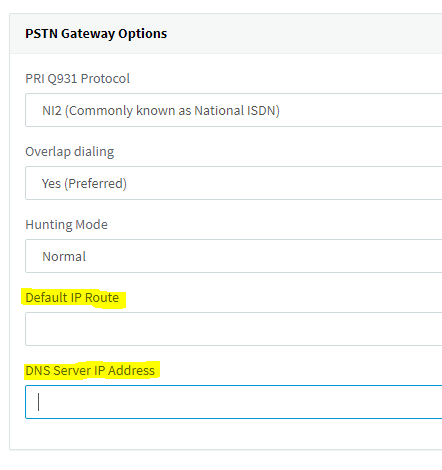 You can now add a Default IP Gateway and DNS Server within 3CX using the new templates. The new sections will be under the 'Options' tab.